Not forgetting that the Mycenaean push eastwards to Cyprus started around 1200 BCE (pre-dating Magnia Graecia) and, as Hannibaal says, there may be a general movement associated with the Sea People. The Cypriot cities abound with myths of being founded after the Trojan War. The reason one of the ancient Greek dialects is called Arcado-Cypriot is that as a result of the Dorian invasions, the Mycenaean language became confined to the central Peloponnese (Arcadia), as well as Dorian-free Cyprus. The Mycenaeans felt such pressure from the northern Greek invasions that it would seem natural that during the Greek Dark Age, some early Greeks might have fled westwards, across the Ionian Sea to the Italic peninsula. DNA results may increase that conjecture, as archaeological evidence is still scant. I honestly don't see how that makes the possibility I mentioned impossible, if anything the practice of Ver sacrum actually lends support to it. It would certainly help explain how an originally North Italian-like set of early Italic groups yielded Sabellian peoples which might well end up falling into the Eastern Mediterranean continuum. While nothing is impossible, I really find it hard to believe that there ever was an unmixed North Italian-like population in Iron Age South Italy. And we are not even talking about the pre-Oscan peoples that might already have been Italic-speaking. I am quite certain that South Italians were never exactly like unmixed North Italians, certainly there was a natural cline in Italy like everywhere else. HOWEVER, I fail to see how South Italy could have been Greek-like, or East Mediterranean, before actual Iron Age East Mediterraneans settled there. The fact that Oscan speakers arrived from North Italy kind of lower the plausibility of them being like East Mediterraneans. 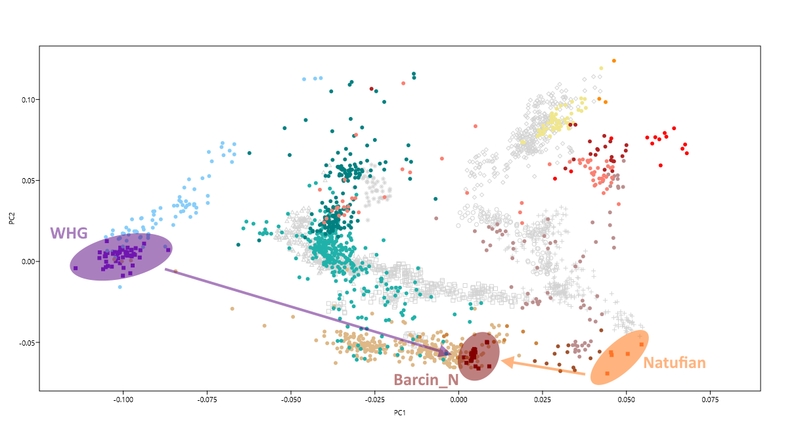 The fact that pre-IA migrations, or EBA Central Italians, were homogeneous and Sardinian-like, which is similar to the BB North Italian samples we have, kind of makes it much more plausible that South Italians belonged to that cline, which included both EEF, both Iran_N/CHG AND WHG - with the first two common for all European Mediterranean populations as recently been described by Pinhasi et al. (2018) (the Iranian admixture found in Bronze Age West Mediterranean populations), and the latter (WHG) totally absent from both Minoans and Mycenaean, aka pristine East Mediterranean populations. Even the "best" poor quality Sicilian BB sample had WHG, which IMO rules it out as having East Med origins. Actually, we do not know that. The most obvious flaw in the upcoming paper is the lack of samples dating back to the MBA and LBA. This is one of the most crucial periods of Italian prehistory as it is the one which saw the arrival of Indo-European speech in the Italian peninsula. So it isn't at all clear that prior to the Iron Age, Central and South Italians were essentially similar to the North Italian Bell Beakers (or even the Remedello samples we have), in fact there are grounds to suspect that by the LBA this genetic profile had in all likeliness been replaced. Again, I would not so liberally dismiss the possibility that at least several of the southernmost Oscan-speaking peoples falled into the East Med continuum, it is worthy of consideration IMHO. Also, WHG is present both in the Minoans and the Mycenaeans. The Umbrian necropolis of Terni, which dates back to the 10th century BC, was identical under every aspect, to the Celtic necropolis of the Golasecca culture." Those paragraphs on Wikipedia are unreliable, the Umbrian necropolis of Terni (=Culture of Terni) wasn't identical to the Celtic necropolis of the Golasecca culture. This is not an association found in serious archeology books, in fact the source in Wikipedia is a local and amateurish research who pushes the silly idea that Umbrians were Celtic. The funerary rite typical of Terni culture is mostly inhumation burial while in Golasecca incineration is practiced as in proto-Villanovan, Este culture, Villanovan etc... Even the definition of Golasecca as Celtic is not without problems but Golasecca is associated with the leopontic language and today is actually considered a Celtic language. There are few books on Umbrians, according to one of the few (Ancillotti and Cerri, 1996) it has been assumed first a penetration between MBA and LBA into the Italian peninsula of the Latin-Faliscan and Venetic groups from the Urnfields (maybe Middle-Danube Urnfield culture) and then (perhaps sooner or later) of a group that we can call Paleo-Umbrians, which could have resemblances with the previous ones. But only later there have been the arrival of a large group formed by a "Safin" populations (Safin=Sabines) that would have given rise to the Sabine, Oscan and Umbrian ethnic groups, so the latter would have resulted from the merger of Paleo-Umbrians and Safin. While Golasecca is the fusion of groups coming perhaps from the RSFO-Rhenish-Swiss group with the former Ligurian layer. Any resemblance between proto-Villanovans, Western Italics, Eastern Italics with the Celtic world is probably due to the common origin in the Urnfields. Celtic ethnos is defined later. As it's unreliable that "Osco-Umbrians began to emigrate in various waves, through the process of Ver sacrum, the ritualized extension of colonies, in southern Latium, Molise and the whole southern half of the peninsula, replacing the previous tribes, such as the Opici and the Oenotrians." There are still huge problems in understanding all the passages, but what is highly likely is that all these IE populations mingled with the previous non-IE inhabitants who already lived in the peninsula, not that they've completely replaced them. Obviously, especially in southern Italy, the strong presence of settlers from the Greek world also had an impact from the 8th century onwards. Which is a pretty good fit, and the WHG just doesn't appear. Which makes sense because we know Mycenaeans are different from Minoans by having additional Steppe admixture. The fit is worse, but no doubt there's WHG there. And as I said, EEF-like ancestry was dominant in all Southern Europe so that doesn't really mean E. Med ancestry. I think that if non-Greek East Med-like populations would have arrived during MBA and LBA to Italy, then Central Italy would have been much more homogeneous during the very late IA (700BC onward). I do not discard the possibility that Mycenaeans or some of the Sea People might have arrived to Italy, but those weren't native Italians and would not constitute the majority of population. I am still shocked though at the amount of Aegean-like population in Central Italy - again, I would expect that as early as the 700BC it would be much more limited to S. Italy (Calabria, Puglia etc.) and no further north than Naples. However, the dating - 700 BC to 20 BC - is quite significant, and we don't know if most of Aegean-like samples from Central Italy are dated to after the Pyrrhic war when which saw Magna Graecia becoming part of the Roman Republic and opened the door for a plausible mass migration up to Central Italy by Magna Graecians. We need to see the study itself to know for sure IMO. You do realise that Barcin lies on a cline extending from the Natufians to WHG/Villabruna, right? I could go on and on like this, the claim that the Minoans and the Mycenaeans had no WHG ancestry is simply false and can easily be disproven. Last edited by Agamemnon; 02-12-2019 at 07:32 PM. I'm sorry, but none of these models show straightfoward WHG. And you know what? Ok, I accept they can be modeled with a population that might include WHG - it's just that whenever I use EEF-like (Barcin_N) + CHG + WHG for Minoans, I get nothing, as for Mycenaean - regardless of the Steppe-derived ancestry I use, I never get more than >1% WHG for them. This is in complete opposite to Sicilian Beaker as well as North Italian Beakers. Both of them seem to be modeled the same - just Sicilian Beakers have less WHG and more CHG than North Italian Beakers - which is a cline I can accept and expect. If they were like Minoans or East Med, then obviously, I'll get no WHG or, based on the models you've suggested, no additional WHG. That simply isn't the case. So we can agree that in terms of admixture models, Sicilian Beakers cannot be modeled in a similar way to how Minoans are modeled, and are more similar to North Italian Beakers. Beaker Sicilians and North Italians seem to require MORE WHG than what exist in any East Med population of the time - and in any case, their predominant EEF-like ancestry is common for all South Europeans of that time. Given that the Aegean is the likely origin of European Neolithicfarmers, we used Bar8 and Bar31 as putative sources to assess theextent of hunter-gatherer admixture in European farmers throughthe Neolithic. f4 statistics of the form f4 (Neolithic farmer, Anatolian,HG, ‡Khomani) indicated small but significant amounts of huntergatherer admixture into both Spanish and Hungarian early farmergenomes, and interestingly, the Early Neolithic Greek genome. Ourmixture modeling analysis also inferred a small genetic contributionfrom the Loschbour hunter-gatherer genome (3–9%) to each of theEarly Neolithic Hungarian and German genomes, but evidence of asmaller contribution to any Aegean genomes (0–6%). These resultssuggest that mixing between migrating farmers and local huntergatherers occurred sporadically at low levels throughout the continent even in the earliest stages of the Neolithic. However, consistentwith previous findings (3), both f4 statistics and ADMIXTUREanalysis indicate a substantial increase in hunter-gatherer ancestrytransitioning into the Middle Neolithic across Europe, whereas LateNeolithic farmers also demonstrate a considerable input of ancestryfrom steppe populations (SI Appendix, SI8. Proportions of AncestralClusters in Neolithic Populations of Europe and Fig. S32). So it seems any WHG ancestry Mycenaeans have is actually from Steppe admixture, but Minoans seem to have very minimal amounts of it if any (or, as you suggested, any additional one that didn't exist in EEF-like Barcin_N populations). We modelled Bronze Age populations using qpAdm/qpWave6 framework (Methods; Supplementary Information, section 2) which relates a set of ‘left’ populations (admixed population and ancestral source populations) with a set of ‘right’ populations (diverse outgroups) and allows one to test for the number of streams of ancestry from ‘right’ to ‘left’ and to estimate admixture proportions. This analysis shows that all Bronze Age populations from the Aegean and Anatolia derived most (~62–86%) of their ancestry from an Anatolian Neolithic-related population (Table 1). However, they also had a component (~9–32%) of ‘eastern’ (Caucasus/Iran-related) ancestry. It was previously shown that this type of ancestry was introduced into mainland Europe via Bronze Age pastoralists from the Eurasian steppe who were a mix of both eastern European hunter-gathers and populations from the Caucasus and Iran4,6; our results show that it also arrived on its own, at least in the Minoans, without eastern European hunter-gatherer ancestry. This ancestry need not have arrived from regions east of Anatolia, as it was already present during the Neolithic in central Anatolia at Tepecik-Çiftlik17 (Supplementary Information, section 2). The eastern influence in the Bronze Age populations from Greece and southwestern Anatolia is also supported by an analysis of their Y-chromosomes. Four out of five males belonging to Minoans, Mycenaeans, and southwestern Anatolians (Supplementary Information, section 3) belonged to haplogroup J which was rare or non-existent in earlier populations from Greece and western Anatolia which were dominated by Y-chromosome haplogroup G21,2,17. Haplogroup J was present in Caucasus hunter-gatherers3 and a Mesolithic individual from Iran4 and its spread westward may have accompanied the ‘eastern’ genome-wide influence. Again, WHG doesn't appear, and as Lazaridis say in the paper, Tepecik_Ciftlik already included CHG/Iran_N like components, so it probably doesn't need as much as Barcin_N. Again, pretty good fit. So I just don't see for Minoans any significant WHG admixture. And Mycenaeans, if they got it, obviously got it from their Steppe admixture - which is probably why WHG always get swallowed in the ADMIXTURE model I attempt. However, Sicilian Beaker is pre-Steppe, and yet has, as expected, WHG (4-6%, depends on how I model them). So obviously, the native population of South Italy weren't East Med, but typical of West Med/Central Med, with probably slightly elevated CHG/Iran_N-like component. If some other migrations in LBA or EIA changed that as you hypothesize - that might just be, but I doubt any of it would be as significant as the Greek settlement of the Late IA. Last edited by Erikl86; 02-12-2019 at 08:36 PM. My point is simple: Using Barcin_N (or Tepecik for that matter) masks WHG-type ancestry that is indeed present both in the Minoans and the Mycenaeans. Again, I don't really see your point here, it's unlikely WHG was present in an undiluted form in the Italian peninsula after the Neolithic. It's definitely not going to be a major factor during the Bronze and Iron ages, and it isn't much of a factor if we are to compare the Sicilian Beaker to the Minoans either.